Part of the fun of club track is trying to figure out logistics. It’s not as straightforward as the scholastic or collegiate experience where coach works with the athletic department to arrange a bus to bring you to your destination and back. We scramble around because half the team can drive, the other half can’t, half the team wants to go a night early, the other half can’t, and Mother Nature always gives us crappy conditions.Â Competing in the New England association as a Vermont-based club means we’re getting used to traveling and there’s no such thing as home track advantage since all of the big meets during indoor are in the Boston area. However, Vermonters pride themselves on being able to make the most out of our long winters and we were ready to celebrate all of the hard work we’ve put in this year. Everyone loves a party at Harvard. 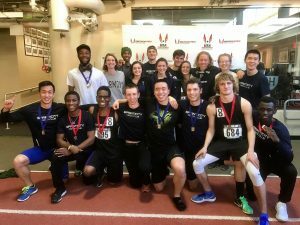 After our team took home the men’s and women’s team titles last year, many around the association were astonished at how many athletes we mobilized to represent the club. This year, due to logistics and other conflicts, we couldn’t put together the same numbers. No excuses though! What we lacked in depth, we made up for with quality. 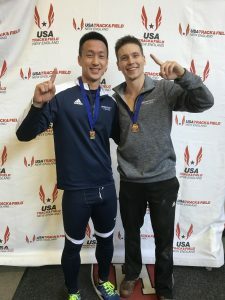 The meet got off to a tremendous start as Kevin Chu and Ian Weider earned gold in the 60m hurdles and long jump respectively. As the day progressed we knew the points would be close and everyone on our team did their part. My Mai pitched in with points in the long jump. Oliver Wood turned in a 51.42 in the 400m to earn 2nd. 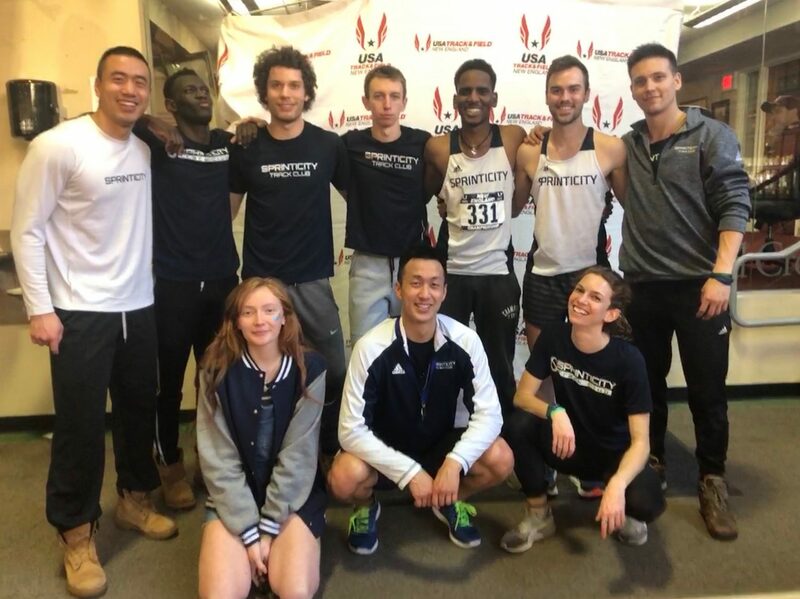 Kyle Chu, Abayomi Lowe, and Will Supple strengthened our position with points in the 60m and 200m dashes. Big shout out to newcomer Brandon Legendre for earning points in the 3000m run. Kevin Chu, Oliver Wood, Madey Madey, and Ismail Liban came together to close out the meet in the 4×440 yard relay to put our final points on the board. Our team total was 30 points, 5 ahead of Boston-North in second. In New England, Sprinticity has been synonymous with speed. Julie McGilpin has been helping to lead the speed revolution. She was the first one on the track for our women’s team and did not disappoint. Julie unleashed an insane 4:54.12 in the mile! While Julie was breezing around the turns, Emily Kollar sent it down the long jump runway for a season’s best of 4.67m to score valuable points. Sonia John, Chinelo Asanya, and Chelsea Davidson led the way for our short sprinters. They were all in the same heat of the 60m and had to endure a timing malfunction and re-run. Sonia went on to take second overall in that event with a time of 8.09, and Chinelo also scored with an 8.46. Chelsea Davidson contributed to the scoring in the 200m. Kayley Hays was our lone representative in the 400m, and also ran the 800m along with Julie McGilpin. The women’s competition ended up being even closer than the men’s. The 4×440 yard relay ended up being the deciding race. Sprinticity women won the relay, and with it, won the team title with a total of 25. The second place club from Wellesley earned a total of 22. When the meet concluded, team scores hadn’t been tallied yet. Our only concern was how to organize rides for the journey back home, and where to stop for food. It’s exhausting to compete, and even more so when we have to do it so far from home. 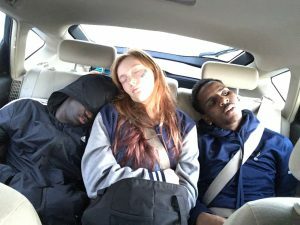 As soon as we hit the road, the kids fell asleep. As we made our way north back home to Vermont, the meet organizers were busy cleaning up and tallying the scores. We were champions in 2017, and we fought hard this past year to build on that success. It may have felt like a dream, but when we woke up, we were still champions in 2018.